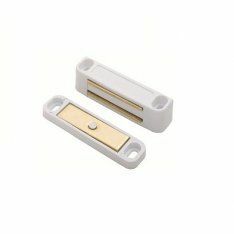 Your home’s internal doors deserve a smooth, quiet catch that won’t wear down or lose function – for doors of this nature, as well as wardrobes and cupboards, consider our selection of magnetic catches, roller catches and mortice latches. These fixtures are purposed with keeping a wide variety of doors and drawers closed – with no keys required. There are numerous styles and sizes to choose from, so creating your own aesthetic flair is easy. We also provide for the more orthodox door styles; the traditional mortice deadlock, the hybrid mortice sashlock and the subtle mortice bathroom lock are all suitable for domestic application. Dead locks and sash locks are primarily based on security while bathroom locks focus on providing privacy, so furnishing your door with a lock relevant to its location is a big decision. For a secure yet minimalist look, see our diverse range of rim locks & night latches. These stylish locks are easy to operate and offer dependable preservation in a compact form. They’re also a modern, easy to install alternative to the classic mortice designs. For those with rebate doors, our rebate sets come in a variety of designs tailored to suit a wide range of sliding doors while prioritising security and efficiency. We stock fixtures in a selection of different metals, and each model has several sizes to choose from. If you’re looking for a more industrial approach, our budget locks won’t let you down. Built for strength and security in any weather, these locks utilise specific universal keys and are therefore less suitable for home use.